When are Evolutionary Algorithms Useful? Evolutionary algorithms are typically used to provide good approximate solutions to problems that cannot be solved easily using other techniques. Many optimisation problems fall into this category. It may be too computationally-intensive to find an exact solution but sometimes a near-optimal solution is sufficient. In these situations evolutionary techniques can be effective. Due to their random nature, evolutionary algorithms are never guaranteed to find an optimal solution for any problem, but they will often find a good solution if one exists. One example of this kind of optimisation problem is the challenge of timetabling. Schools and universities must arrange room and staff allocations to suit the needs of their curriculum. There are several constraints that must be satisfied. A member of staff can only be in one place at a time, they can only teach classes that are in their area of expertise, rooms cannot host lessons if they are already occupied, and classes must not clash with other classes taken by the same students. This is a combinatorial problem and known to be NP-Hard. It is not feasible to exhaustively search for the optimal timetable due to the huge amount of computation involved. Instead, heuristics must be used. Genetic algorithms have proven to be a successful way of generating satisfactory solutions to many scheduling problems. Evolutionary algorithms can also be used to tackle problems that humans don't really know how to solve. An EA, free of any human preconceptions or biases, can generate surprising solutions that are comparable to, or better than, the best human-generated efforts. It is merely necessary that we can recognise a good solution if it were presented to us, even if we don't know how to create a good solution. In other words, we need to be able to formulate an effective fitness function. Engineers working for NASA know a lot about physics. They know exactly which characteristics make for a good communications antenna. But the process of designing an antenna so that it has the necessary properties is hard. Even though the engineers know what is required from the final antenna, they may not know how to design the antenna so that it satisfies those requirements. NASA's Evolvable Systems Group has used evolutionary algorithms to successfully evolve antennas for use on satellites. 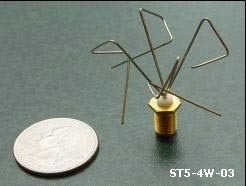 These evolved antennas have irregular shapes with no obvious symmetry (one of these antennas is pictured below). It is unlikely that a human expert would have arrived at such an unconventional design. Despite this, when tested these antennas proved to be extremely well adapted to their purpose. There are two requirements that must be met before an evolutionary algorithm can be used for a particular problem. Firstly, we need a way to encode candidate solutions to the problem. The simplest encoding, and that used by many genetic algorithms, is a bit string. Each candidate is simply a sequence of zeros and ones. This encoding makes cross-over and mutation very straightforward, but that does not mean that you cannot use more complicated representations. In fact, we will see several instances of more advanced candidate representations in later chapters. As long as we can devise a scheme for evolving the candidates, there really is no restriction on the types that we can use. Genetic programming (GP) is a good example of this. GP evolves computer programs represented as syntax trees. The second requirement for applying evolutionary algorithms is that there must be a way of evaluating partial solutions to the problem - the fitness function. It is not sufficient to evaluate solutions as right or wrong, the fitness score needs to indicate how right or, if your glass is half empty, how wrong a candidate solution is. So a function that returns either 0 or 1 is useless. A function that returns a score on a scale of 1 - 100 is better. We need shades of grey, not just black and white, since this is how the algorithm guides the random evolution to find increasingly better solutions.